Just like the opening weekend five years ago Cardiff City lost their opening Premier League game 2 - 0. Then it was West Ham, this time it's Bournemouth and like last time on reflection it will be a disappointing feeling that City could not get something out of the game. The first half could have been embarrassing as Bournemouth took the lead through Ryan Fraser and could have doubled it when Manga was punished for an accidental trip. 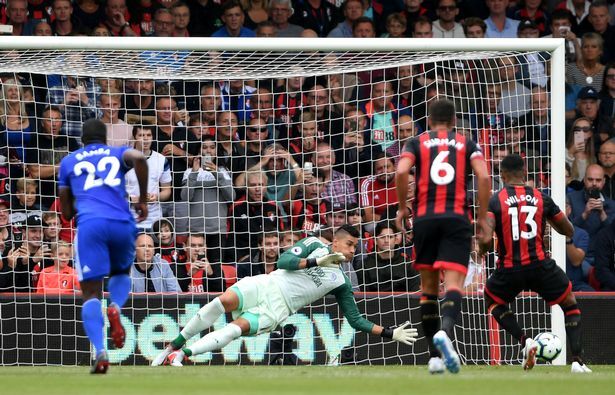 Callum Wilson took the penalty but Neil Etheridge dived the right was and tipped the ball away for a corner (pictured). Cardiff got some success out wide but didn't manage one effort on target before the break. Second half was different. City got forward more and at times had Bournemouth on the back foot. A number of corners into the box caused concern, a Bobby Reid free kick went high over the bar, Callum Paterson saw his effort blocked and cruelly a City effort looked be going in but hit Sean Morrison on the line and was scrambled away. The goal never came though and some lose defending near the City corner flag as the clock hit 90 mins was capitalised on by Simon Francis and Wilson was clear in the box to finish from Francis' pass. Bobby Reid was the only debutant in the City starting line up with Josh Murphy coming off the bench in the second half. Next up Cardiff face Newcastle in the live Sky game next Saturday 12:30pm. Newcastle also lost today (1 - 2 v Spurs) and there were defeats for Fulham, Brighton and Huddersfield as well. Leicester lost on Friday night. Bournemouth: Begovic; Smith (Defoe 93), S. Cook, Ake, Daniels; Brooks (Francis 67), Gosling, Surman, Fraser; Wilson (Mousset 93), King. Subs not used: Boruc, Mings, Cook, Ibe. 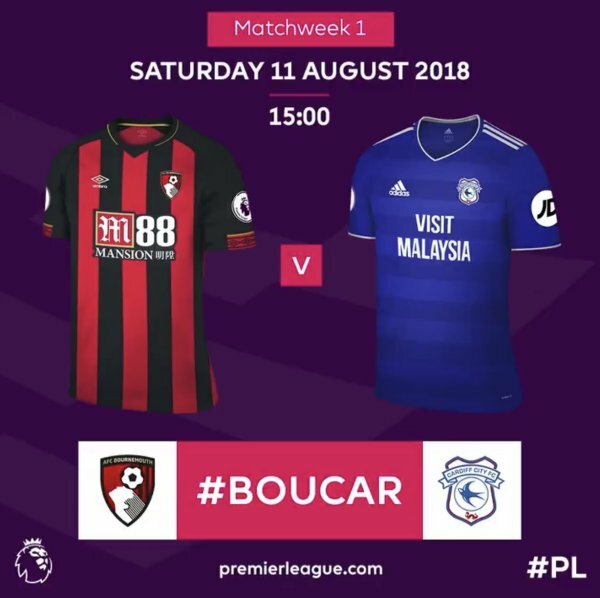 Cardiff City: Etheridge; Peltier, Morrison (C), Manga, Bennett; Bamba, Paterson (Ward 63), Ralls; Mendez-Laing (Murphy 63), Hoilett, Reid (Madine 87). Subs not used: Smithies, Richards, Cunningham, Camarasa.